I know this must sound odd, but I very rarely read music magazines. I do always have books on music at hand when I am listening to music, and every year read all old copies of Vinyl magazine and other old stuff, I never go out and buy new magazines. One exception though: I always receive a free courtesy copy of Gonzo Circus, that great great Belgium/Dutch magazine, who have always been very kind to whatever I do. In the recent issue there is a very nice review of the new Beequeen CD. I was looking if its online, but their site is down. Well, do it yourself and look for it. Last friday I was waiting in line for the post office with my parcels, always passing the magazine stand, the far end for kids and music. Easy to pick one out and read while waiting, but they always look so boring. 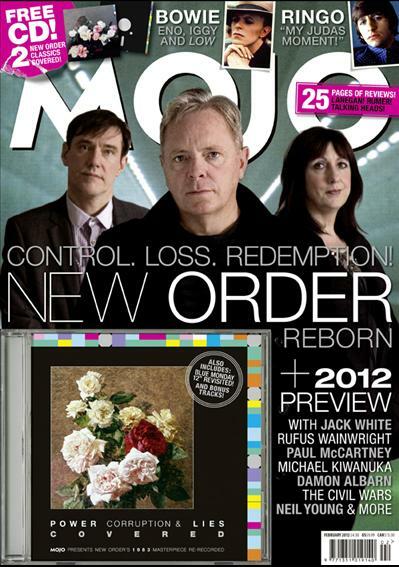 But lo and behold, New Order is on the front of this months Mojo and there is no secret in the fact that I am big fan. Comes with a cover mounted CD (all for 9 euros) of bands playing all the tracks from ‘Power Corruption & Lies’, plus a bunch of boni (plural for bonus) inc a great Biosphere rendition of ‘Blue Monday’. So I’ve spend my hangover sunday afternoon reading an old fashioned music magazine, learning all about drummer boy Ringo, Bowie and Tim Hardin – even listening to bit of the latter. Time to move out of the house and see a concert at Extrapool.